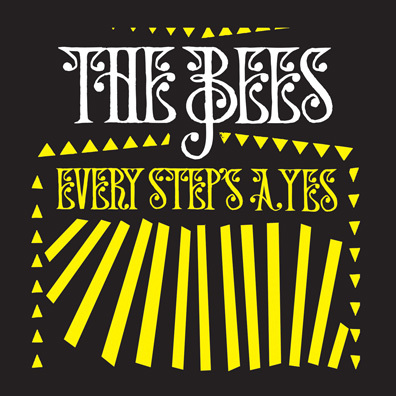 The fourth album by Isle of Wight, U.K. natives The Bees (or A Band of Bees as they are known in the U.S.) is a far cry from the band's last album, 2007's Octopus. Gone are upbeat, funky jams such as the slide guitar-augmented "Who Cares What the Question Is?," jazz-inflected fare such as "Left Foot Stepdown," and jaunty numbers such as "Got To Let Go" and "End of the Street." Instead, Every Step's a Yes more closely reflects a couple of that album's more subdued tracks, the smooth "(This Is For the) Better Days" and the lightly folky "The Ocularist." Overall, Every Step's a Yes, which was released in 2010 overseas and is just now getting a stateside release along with six bonus tracks, is mellow psych-folk that largely eschews the more bombastic and eclectic statements of the band's past recordings. Pretty much my thoughts as well. The first few tracks are alright, but by the time the end rolls around, I’m left wishing there was something that reached the highs found on “Free The Bees”. Bummer.